Dr. Kina S. Mallard officially was inaugurated April 15 at the Falany Performing Arts Center. The Northside Hospital-Cherokee Conference Center was packed Friday night as more than 200 guests joined together for dinner and dancing to celebrate the inauguration of Reinhardt University’s 20th President, Dr. Kina S. Mallard. The Inauguration Gala was a culmination of the day’s events, which included a morning prayer service and the inauguration ceremony held Friday afternoon at the Floyd A. and Fay W. Falany Performing Arts Center on the campus of Reinhardt University in Waleska. The prayer service at the Blanche Hagan Chapel was led by the Rev. Timothy J. Emmett, pastor of Waleska United Methodist Church. 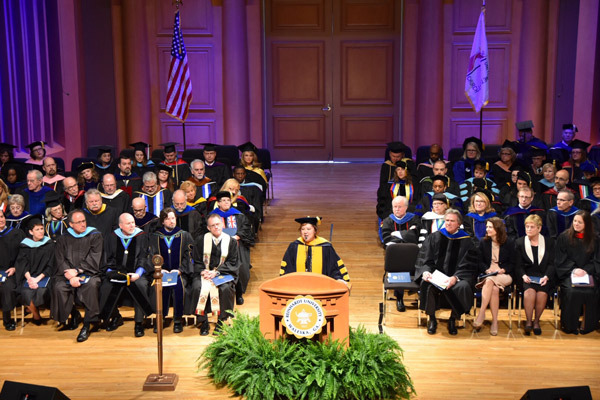 It included music by the Reinhardt University Chamber Singers, led by Dr. Martha Shaw, and prayers for faculty, staff, students, alumni, the community, the Board of Trustees, and the president and her leadership team. Later in the afternoon, Mallard officially was inaugurated during a ceremony at the Falany Performing Arts Center. 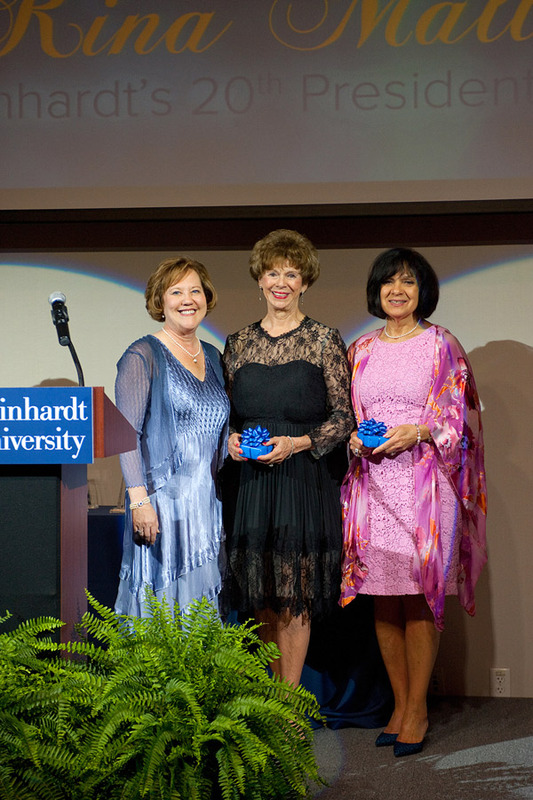 Dr. Kina Mallard is pictured with JoEllen Wilson and Dana Hall who chaired the inauguration committee. Alumnus Mathew Pinson (’05), lay leader of the North Georgia United Methodist Conference, gave the invocation, followed by the welcome and guest recognitions by William G. Hasty Jr. (’67). The welcome was followed by greetings and encouragement by different members of the Reinhardt family. Student Government Association President Jamieson Palmer spoke on behalf of students, while the Rev. Susan Moore Pinson (’84), president of the Alumni Board of Governors, spoke on behalf of the alumni. Dr. Jonathan Good, chair of the Faculty Senate, gave greetings and encouragement on the faculty’s behalf, while head football coach Drew Cronic gave the address from the staff. 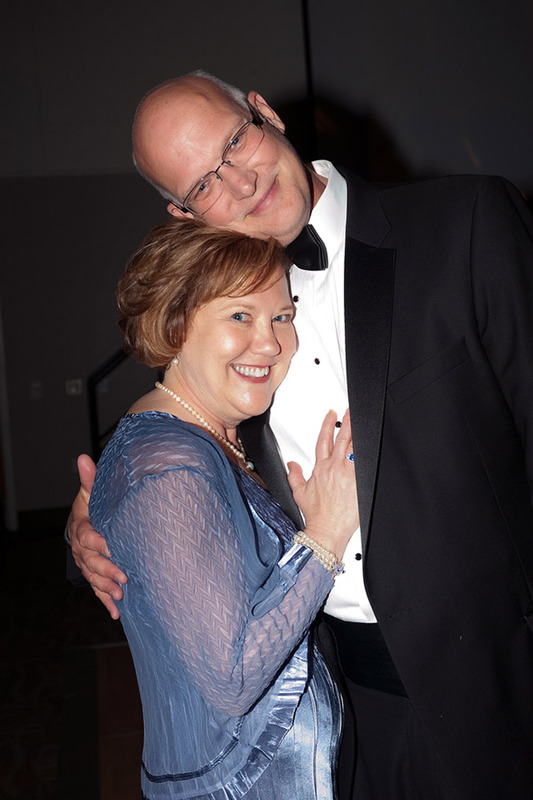 Dr. Kina Mallard celebrates with her husband, Steve Dietz. Deborah Marlow, secretary of the Board of Trustees, spoke on behalf of the Trustees, and Waleska Mayor Doris Jones welcomed everyone on behalf of the Waleska community. Dr. Mark Roberts, vice president and dean for Academic Affairs, read an inauguration poem, followed by the Reinhardt University Chamber Singers’ delivery of “Alleluia,” under Shaw’s direction. Hasty introduced Dr. Mallard as the 20th President of Reinhardt and Emmett led the Investiture of the President. Dr. J. Thomas Isherwood, who held the university presidency for 13 years prior to Mallard, presented Reinhardt’s 20th president with the presidential medallion. Mallard addressed those in attendance about the work she and her team have done over the last year and the plans laid out for the future. “To Deepen Academic Relevancy, we are creating a teaching and learning collaborative which will bring experts to campus to facilitate robust, innovative, high-impact conversations and professional development of our faculty,” she said. In addition, she highlighted grand construction plans geared at meeting the needs of Reinhardt’s growing campus. Construction is expected to occur over the summer. Those plans are the first steps of implementing the campus master plan, which will, in the near future, include a new theater building, a renovation and expansion of the Gordy Dining Facility, new residence halls and a new nursing building. She also spoke about Reinhardt’s mission of educating the whole person by developing servant-leaders not only to be the best in the world but the best for the world. Mallard was selected as the university’s 20th president in February 2015. She took the reins leading the university in May last year. Mallard comes from Carson-Newman University in Tennessee where she served as executive vice president and provost. She holds a Doctorate in communication and a Master of Arts in organizational communication from the University of Tennessee, Knoxville, and a Bachelor of Science in speech and theatre from Middle Tennessee State University. She and her husband, Steve Dietz, have five children and one grandchild.